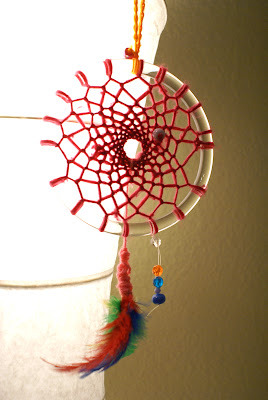 That is such a beautiful dream catcher - I want to get me one too! Not because I am having bad dreams, but having bad stuff filtered out is always good. The feather detail is just s pretty! I think a nice bangle will work just perfect...? Thats a really cute project! the dreamcatcher looks really pretty! the picture is really lovely! what even more awesome is that you both made it together :). Here's wishing everyone sweet dreams! I really want to see that movie. I would love to go to India someday, so far I've only seen it in movies! Anita, make one! The ones that the native Americans make are really gorgeous but this one is not too shabby either! You are supposed to hide the mass of yarn/thread above the feathers with some felt. We didn't have any so we didn't hide it. Medha started off with a bangle and she got very frustrated and very quickly. It's difficult to thread it through to make the web when the diameter is small, especially when working with yarn. Which was when I put a stone on my heart and gave her one of the purse handles. I did try with the bangle and was able to make a slightly better web than hers but it gets difficult rather quickly. I guess if you use twine it should be easier with a bangle. Kalyn, it's not your mainstream cinema kind of movie. What I really appreciated is that there weren't any caricatures that one usually finds in movies filmed in foreign countries, especially India. Some things jarred or were not explained but in general, it was very well done. Adrien Brody is superb and Owen Wilson is also very good. I went to see it with my girlfriend who is American of Italian origin. She said it was all very foreign to her and loved every minute of it. 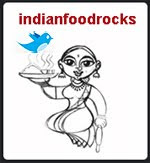 India can be a huge culture shock but is a very enjoyable and rich experience. I think everyone should visit India at least once in their lifetime. Knitting? I love knitting! Hand-knits are the best, and I have a bunch...but it takes longer and longer now, I have gave up on a 6 year old sweater project last year and started another :D...maybe I can wrap it up this year. Must take it out now that it has cooled down and I can bear holding yarn in my hands...look forward to hearing about your latest...I remember seeing something on these pages a while ago...you should try the pattern on your red sweater - the one your mum knit for you. Nice looking deam catcher. I also need one for my daughter, she has been comming to our bed a lot these last few weeks ...........she is not small anymore she is 15 !!!!!!!!!!!!!!! it's beautiful. for two nights in a row, i've dreamt of losing things. There are so many like these from the Navajo nation. Being an Arizonian, I enjoy every one of 'em. I have no idea about dreamcatchers...but looking at it does give a nice feeling, more so the sentiment behind it...your's of course is extra special, isn't it, for it was woven by you and Medha.